Dinner and Book Signing to Benefit with Diana Kennedy. “Nothing Fancy”. November 2016, Santa Cruz. 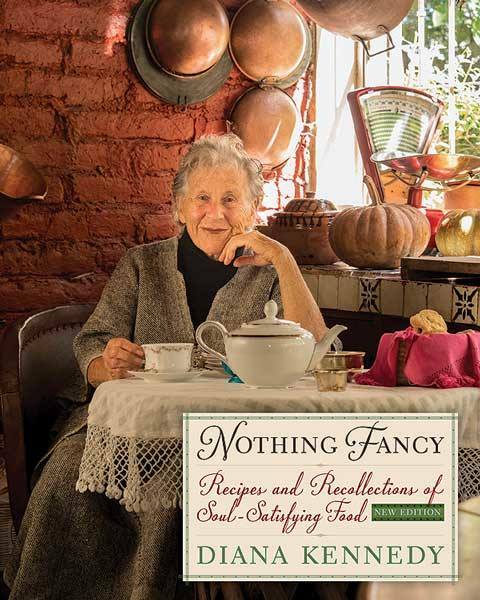 Diana Kennedy, esteemed cookbook author and culinary historian, will visit Santa Cruz California in November and appear at three events celebrating the recent re-issue of Nothing Fancy: Recipes and Recollections of Soul Satisfying Food. Originally published in 1984, in this revision Kennedy has added recipes, revised old ones, reworked sections and added more, including itemized lists of things she loves – good butter, a perfect croissant, lard, and Seville orange marmalade, and things she vehemently dislikes – kosher salt, fat-free dairy products, and GMOs among them. Diana Kennedy is one of the world’s preeminent scholars on Mexican cooking and one of its best-known food writers. Renowned for her uncompromising insistence on using the correct ingredients and preparation techniques, she has taught generations of cooks the world over how to prepare traditional dishes from the villages, markets, and homes of Mexico and in doing so, has documented and helped to preserve the country’s diverse and rich food ways. TUESDAY, NOV 15 SOIF WINE BAR will host a dinner for Diana. 6pm reception and book signing, 7pm dinner.Tickets are $150 per person and include a copy of Nothing Fancy. A portion of the proceeds will be donated to the Diana Kennedy Center, a foundation committed to the preservation of Mexico’s cuisines and biodiversity. Reservations online at opentable.com or call Soif, (831) 423-2020. THANKS TO OUR BELOVED BOOKSHOPP SANTA CRUZ, BOOKS WILL BE AVAILABLE FOR PURCHASE AT ALL EVENTS…UNTIL WE RUN OUT. YOU MIGHT WANT TO GET YOUR COPY NOW!